It’s been awhile since we heard from Silkfoot. I thought we should fix that. Thomas Valladon knew something was off the moment he opened the door. It was a stormy night, the rain so heavy it bounced several inches off every surface it collided with. Thunder rumbled in the distance, threatening to whip the gale into a frenzy. Only the occasional flash of lightning alleviated the gloom. The kind of night that could drown all but the loudest sounds, especially with cars splashing through gathering puddles not five feet away. But working in security made Thomas’s other senses keen. He noticed the out of place blot of shadow, darker than its surroundings. The dim flash of cream and two dots of emerald illuminated by the latest lightning strike, along with the barest hint of a smug smile. “You could have called,” Thomas grumbled, letting his hand slide away from the holster of his gun and back to the handle of his umbrella. He had already dripped a huge puddle just inside the door. With a sigh, he kicked off his shoes, letting his already damp socks soak up the stray moisture while he tossed the half-folded umbrella into the corner. The thin cloth canopy had done little to protect him on the walk home and his damp uniform clung to his skin. He had been looking forward to a relaxing evening in dry sweats, probably including pizza delivery and whatever stupid movie he could find on TV. Most people who opened the door to find a stranger lounging on their couch wearing a skin-tight suit of drab grey clearly designed to blend into the surrounding shadows would have had a much different reaction. But then most people hadn’t been waiting three months for that stranger to reappear. Of course, he always chose the worst possible moment to make himself known. The last time Thomas encountered him, it had been a particularly stressful day in the office. He had been on his way to his favorite cafe, hoping to spend his lunch break in relative relaxation, and there he was in the window; the man from the party that no one else seemed to remember. He gave the living room wide berth on his way to the hallway, preferring not to drip water on the rugs or furniture. But he did leave his bedroom door open the slightest crack, in case his visitor said something. He didn’t know why, but he trusted the man wasn’t going to creep across his apartment and peek through the door at him while he was changing. As his fingers fumbled with damp buttons, Thomas couldn’t help but recall the way Dylan looked at him the last time they met, as if beckoning him to the other side of his table the way a spider might invite a fly into their web. And Thomas had flocked to him then, just as he was likely to do so now. I was hoping you could tell me if I’m going mad, he had said as he settled uncomfortably into the empty chair to await the arrival of his food. You see, I’m apparently the only one who can remember you from that night. Dylan had looked at him with a strange glint in his emerald eyes, that infuriatingly playful smile dancing across his lips. If you’re going mad, I’m not sure who you’re having lunch with. That doesn’t change the fact that no one else remembers you, Thomas had persisted, already aware he wouldn’t be able to get anything out of the man he didn’t want to share. Haven’t you ever heard that old saying? Dylan countered. Out of sight, out of mind. That’s me. You must have some skills then. Oh, a lot of them. Yet, no matter what I do, I can’t seem to make you forget about me. Why is that? Then, as now, Thomas thought about Dylan sliding through the crowd the night of the office party, mingling with the consultants and their clients, laughing, chatting, the very life of the party. And when he had finished with it all, he had simply walked away. Out the door and out of their memories, a ghost, an echo. “Beggars can’t be choosers,” Dylan replied with a shrug, though not before he let his eyes rake Thomas’s figure appreciatively. He accepted the pile of clothing and darted off to the bathroom before Thomas had a chance to say anything else. With another soft sigh, Thomas settled onto the opposite end of the couch, waiting for the man to return, their last meeting still in the forefront of his mind. So tell me, Thomas, how long have you diligently provided services to your current employer? I’ve been in security six years. But I’ve only been with this company about a year and a half. He couldn’t forget the soft sound Dylan made in response, almost a coo. And before this company, how long did you stay with the last one? And the one before that? Or how about the one that came before that one? Six months. A year. Nine months. Thomas had been able to rattle them off without really thinking about it. Actually, he was starting to think he’d been at this job for too long. Three more months and he could at least make it to the two year mark, but he really needed three if he wanted to make it look like he had broken the cycle. Dylan had clicked his tongue softly. Companies don’t like that, you know. No matter how good you are at the job, if you keep moving around like that, they’ll eventually get weary of you. They don’t consider it worth the money to train you if they can’t keep you long-term. They like people who are dependable, reliable… predictable. So why’s an intelligent man like you – who probably already knows all this – taking a risk like that? He remembered staring into that green-eyed gaze as though daring the man to back away from the question. After all, it wasn’t anything he hadn’t heard before. None of them were challenging enough. If security hasn’t challenged you in six years, what makes you think it’s ever going to? I’m good at it. And he had a family to provide for. They might live in another state and never talk to him, but they deserved what little he could do to secure their future. Didn’t they? But it doesn’t engage you. 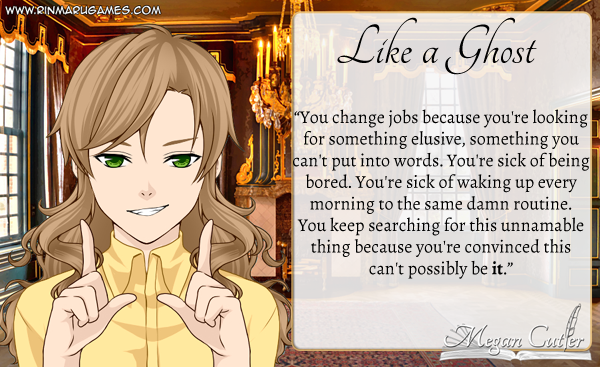 You change jobs because you’re looking for something elusive, something you can’t put into words. You’re sick of being bored. You’re sick of waking up every morning to the same damn routine. You’re sick of each day following after the other in an endless march of monotony, dull, drab, never ending. You keep searching for this unnamable thing because you’re convinced this can’t possibly be it. It had been a surreal experience, as if his mind had taken human form and parroted back to him everything he’d spent the last six months telling himself. And at the end of it, he’d been half certain he was going mad. The soft click of the bathroom door opening drew him back to the moment and he watched Dylan pad across the floor and flop onto the couch beside him, looking somewhat ridiculous in the too-large clothing. Once again, Thomas’s mind drifted away from the dreary evening he inhabited to the bright, sunny afternoon he sat across from this man, demanding to know what he did for a living. You want to know what I do for a living? Dylan had repeated the question, grinning like the cat that caught the canary. Whatever I damn well please. When he thought back on it now, it all seemed like some kind of fucked up job interview. It had covered everything from his skills to his work history to his ambitions, Dylan had even asked about his family and his social ties, though Thomas had merely deflected those topics. Still, he couldn’t help wanting to know more about this stranger and the odd life he led. There was something so appealing about it all. Dylan leaned across the gap between them until his face was mere inches from Thomas’s. In that moment, Thomas was struck by how little his guest smelled like anything. No perfume, no shampoo or aftershave, just the scent of his own dryer sheets used on the clothing his guest wore. “I understand,” Thomas said without hesitation. The conversation moved on to other things. Thomas ordered that pizza after all, and a second one to share with his guest. Dylan loved to laugh and presented plenty of opportunities for Thomas to share it. He stayed up much later than he should have, considering he had to work the next day. But who knew when Dylan would show up on his doorstep again? In the morning, he found a pile of folded blankets in the middle of his couch, the borrowed clothing neatly folded and laid on top. But Dylan and his strange attire were nowhere in sight. Somehow, Thomas wasn’t surprised to find his guest an even earlier riser than himself. He cleaned up and prepared to spend the day acting as if everything were normal and a thief hadn’t spent the night sleeping on his couch, hoping it wouldn’t be three months before he saw the man again.